The Royal Parks of London consists of eight royal parks; those in central London including St James’s Park, Green Park, Kensington Gardens, Hyde Park and The Regent’s Park, and those more on the edge of London, including Richmond Park, Bushy Park and Greenwich Park. 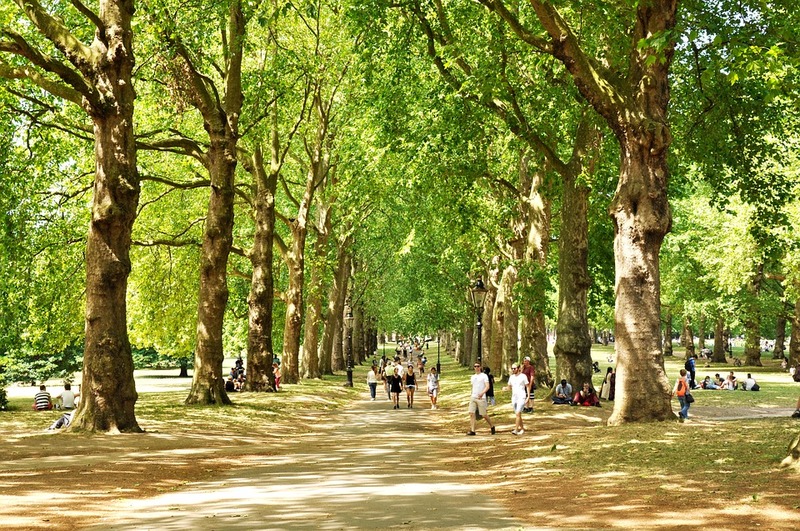 Each Royal Park of London gives a nature injection to the capital, providing a physical space to rest and unwind as well as cooling the local urban temperatures. They even help to absorb pollution and flood water. On top of this, they have fantastic facilities for people of all ages, including gym equipment, boating, playgrounds for families with children, even pelican feeding in St James’ Park! Deckchairs can be hired during the summer months (March-October) at all the central London Royal parks. Unlike conventional public parks, the Royal Parks of London are owned by the crown and managed by a government agency called Royal Parks. Being historic places there are also many statues, fountains, stonework and other artworks, all being carefully preserved and managed for the future, and waiting for you to discover. All the parks offer events year round (see each Royal Parks of London website for details) from walking tours to bike rides, exhibitions, events for families, even yoga and outdoor holiday playschemes. Four of the eight Royal Parks of London also play host to the seven-mile Diana Princess of Wales Memorial Walk with 90 plaques set in the ground, that takes you within sight of famous buildings and locations associated with the Princess during her life. 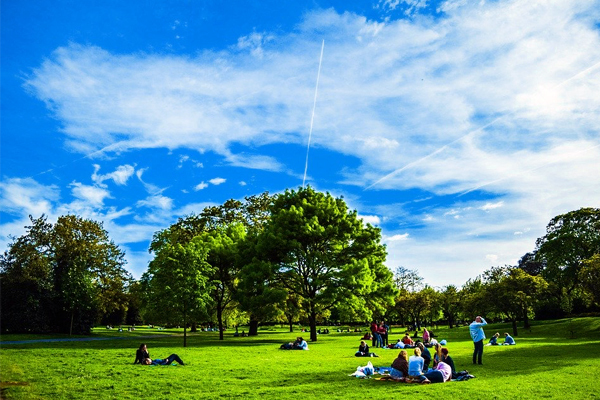 These four parks are St James’s Park, Green Park, Hyde Park and Kensington Gardens. Each Royal Park has its own character. This blog will introduce each and what they have to offer, special spaces in London that can be enjoyed all year round. St James’s Park and Green Park border each other, with Buckingham Palace and Gardens in between. St James’s Park has always been known as an ‘animal park’ from King James I’s time, who kept exotic animals such as camels, crocodiles and an elephant in the park. Today it is known for its Pelican feeding in the afternoons between 2.30 and 3pm. The Pelicans can be found at the eastern end of the lake opposite Horse Guards Parade, next to Duck Island Cottage. This is a pretty Swiss chalet with its own little gardens, the main public path running past. Opposite this is the grandeur of the Foreign and Commonwealth Office. As you walk around you’ll notice the Blue Bridge; a low-arched concrete bridge offering spectacular views and glimpses of the local waterfowl (other than the common mallard the park boasts a great range of birds including Shelduck, Teal and Goldeneye, and exotic birds such as the Black Swan). Just after dusk, it is worth going to see Common Pipistrelle bats which will enchant you, through the trees of the park. St James’s is the oldest of the Royal Parks of London and retains its importance as its the park overlooking Buckingham Palace, home to the legendary Trooping of the Colour, the yearly spectacle to mark the Queen’s official birthday. Here on Horse Guards Parade in St James’s Park, you can witness the Queen as she personally carries out an inspection of the troops, while the ‘Colour’ (or battalion flag) is ‘Trooped’ – or carried – slowly down the ranks of soldiers. This finally ends with the Queen leading the troops down the Mall to Buckingham Palace, making a salute at the Palace. At the end of the ceremony, The Queen appears on the balcony of Buckingham Palace. The daily (during summer months) Changing of the Guard is a spectacle many tourists wish not to miss out on and from St James’ Park you can get a good view without necessarily joining the crowds outside the Palace gates (the closest you will get to the Guards themselves). If you stand on the Mall near the Marlborough Gate in St James’s Park a bit before the starting time of around 11 am, you can see the St James Palace Detachment of the Guard leave St James’s and march up the Mall to meet the main Guard at Buckingham Palace. There are many other places to stand to see the Changing of the Guard – this is just one of the popular ones. In winter the Changing of the Guard is held Mondays, Wednesdays, Fridays and Sundays between 10.15am and 11.45am. Changing of the Guard at the Horse Guards Arch takes place daily at 11am (10am on Sundays) and also lasts about 30 minutes. You will find this at the other end of St James’s Park, on Horse Guards Parade by Whitehall. Many people enjoy this Guard Change on horseback more than the Buckingham Palace Guard Change. They find they can get nearer to the action and although different, with the guards in their bright tunics and the magnificent horses themselves, still has much of the pomp and pageantry we come to expect from a Royal event. Green Park borders Buckingham Palace with Constitutional Hill – a nice thing to do is to follow in the footsteps of King Charles II, and walk up this same road, where he would walk along for his daily constitutional with his spaniels. It is the smallest of the Royal Parks, being a simple peaceful triangle of mature trees and grasslands, with its own range of memorials, fountains and statues. These include Canada Gate – the monument to Queen Victoria, the Bomber Command Memorial to honour those who died from the Bomber Command during the Second World War, and the Memorial Gates, dedicated to those who died in the World Wars from the Indian Sub-Continent, Africa and the Caribbean. Like Hyde Park and The Tower of London Green Park is also host to Royal Gun Salutes – ceremonial guns fired to mark special royal occasions; in Green Park’s case, on State Visits, at the State Opening of Parliament and for The Queen’s Birthday Parade. Like the other parks, Green Park has its own refreshment points; at Ritz Corner and Canada Gate. They offer coffee, ice cream, snacks & freshly made sandwiches. Hyde Park borders Kensington Gardens to the west and is separated from Green Park by the busy A4. Like all the Royal Parks of London it has plenty of recreational facilities to offer. Also look out for seasonal events including Flow Yoga (held on a Monday night – book in advance), and nature-based holiday activities, where you can drop off your children. Hyde Park has a lot to offer including its most famous feature – the Serpentine Lake. Here there is boating from April to October where you can hire a rowing or pedal boat for around £10 a person (£5 for kids). It also offers the Solarshuttle – the UK’s first solar-powered boat! The Serpentine has its own designated lido area for freshwater swimming, which the public is able to use during from June to September (members of the swim club can use all year-round). The price remains under £5 for adults and under £2 for kids and offers a sun terrace, children’s play area, and the Lido Cafe/ Bar kiosk selling everything from baguettes to fish and chips, hot and cold drinks and it even has a license to sell alcohol. It is a treat in itself, being a lovely building with colonnades, and plenty of tables for outdoor dining by the lake. Close to the Cafe is the Princess Diana Memorial Fountain, a beautiful circular shaped memorial built with Cornish granite, where water flows from the highest point in two directions, before swirling into a pool at the bottom. It is a reflective space to sit and refresh your feet, popular with visitors. Hyde Park contains many other memorials as well as statues and fountains; one of the popular ones is the Pan statue, based on J.M. Barrie’s famous Peter Pan character, and showing a Peter himself playing the pipes, with the family and dog. It can be found by Edinburgh Gate on the south side of Hyde Park. The Bandstand in Hyde Park (in the southwestern corner, just past the end of the Serpentine) is one of the oldest in Britain, built in 1869. It forms part of the Hyde Park Winter Wonderland event held in the park at Christmas. At the southeastern end of the park, along South Carriage Drive, near the end of the Serpentine, you’ll find a newly created, natural looking play space, with plenty of seating and careful planting for a relaxed feel. At Hyde Park, you can turn up and play Tennis on one of six tennis courts for free, or inquire about becoming a member. There are even coaching courses on offer. In addition to tennis, there’s lawn bowls and a putting green, available in the summer months (available to hire). There are football pitches free to use – but they must be booked in advance. The park even offers a special exercise equipment area for ‘seniors’ – aimed at older people, it is open to anyone over the age of 15. There are a horse riding arena and designated routes for riding around the park, taking in fine views. Speakers’ Corner is a quirky place if you like listening to public speaking…free speech in action. Since 1872 this has been a site where on a Sunday morning, speakers stand up and expound their views on pretty much anything (as long as the police consider their speeches lawful). It is free for anyone to turn up unannounced to speak on any subject – previous noteworthy’s include such figures as Karl Marx, Vladimir Lenin and George Orwell. You’ll find Speakers’ Corner at the north-east edge of Hyde Park, nearest Marble Arch and Oxford Street. Kensington Gardens was once part of Hyde Park, separated only by the West Carriage Drive. It includes the tail end of the Serpentine and is host to the Serpentine Galleries, as well as the splendour of Kensington Palace, the official London residence of the Duke and Duchess of Cambridge. 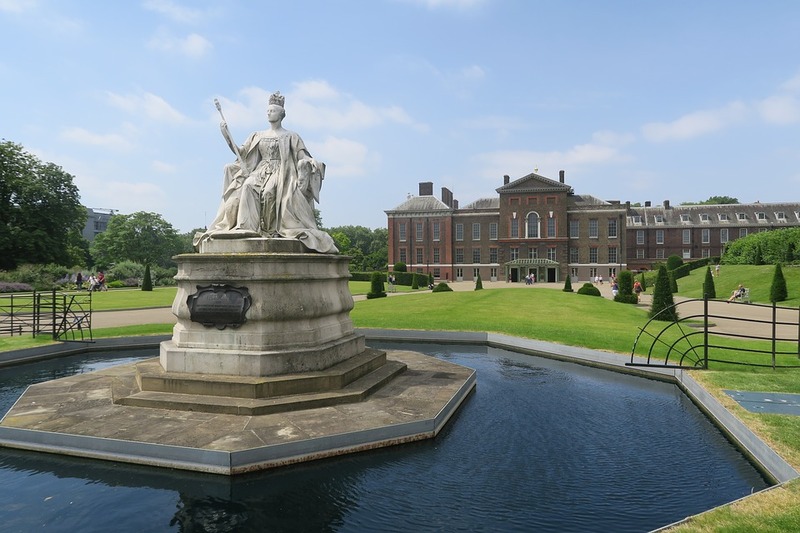 Parts of Kensington Palace itself are open to the public (to book tickets go to the Historic Royal Palaces website). There is even an allotment home to some chickens! Kensington Gardens was, of course, a place of inspiration to local resident J.M. Barrie, author of the Peter Pan stories, so here you can see another Peter Pan Statue (there is one in Hyde Park) – this is the original built-in 1912 – featuring Peter Pan with lots of animals and fairies at his feet, blowing a horn. Kensington Gardens is home to the perennially popular Diana Memorial Playground at the northwestern end, on the edge of the park near Bayswater. Based on the Peter Pan adventures, this playground is home to the magnificent wooden pirate ship, teepees, a sensory trail and even a beach! It is an inclusively designed playground, aiming to reach out to children of all abilities, allowing them to really stretch their imaginations. There are two art galleries situated either side of the Serpentine Bridge, in Kensington Gardens – the original classical-style Serpentine Gallery was (built in 1934 as a tea-room, opened 1970 as a gallery), just south of the lake, and the Serpentine Sackler Gallery, built 2013, north of the lake. Admission is free, and they are open daily from 10am-6pm during the summer season. The latter features a shop, restaurant and social space as well as world-renowned exhibitions of art, architecture and design. On the north side of the garden, you will find the Italian Water Gardens, created in the 1860s, with beautiful stonework and the Tazza Fountain, an elaborate mix of four basins. Worth seeking out is Queen Victoria and Prince Albert’s initials on one of the walls of the Pump House, at the north of the gardens. Look out for the Italian Gardens Cafe offering salads, sandwiches, snacks, and hot and cold drinks. There’s even a “Gelato cart” around in the summer, on the deck or on the North Walk. The relatively new allotment in Kensington Gardens can be found next to the storage yard. It is a place you can just wander into, and even pick up some useful tips for growing your own fruit and vegetables. It is here you will find this experiment in self-sufficiency expanded with the little group of chickens, who live here. The Regent’s Park is along with Hyde Park and Kensington Gardens together, one of the largest Royal Parks in Central London. Like the others, it has its own boating lake, with boat and pedalo hire, an open-air theatre, sports facilities including the Hub – the largest outdoor sports facility in London, as well as many different looked after gardens including a community wildlife garden. This year for the first time in years music will be heard from the iconic bandstand, this summer between 24th June and 2nd September, from 3pm to 5pm every Sunday afternoon, with a regular programme of free concerts. 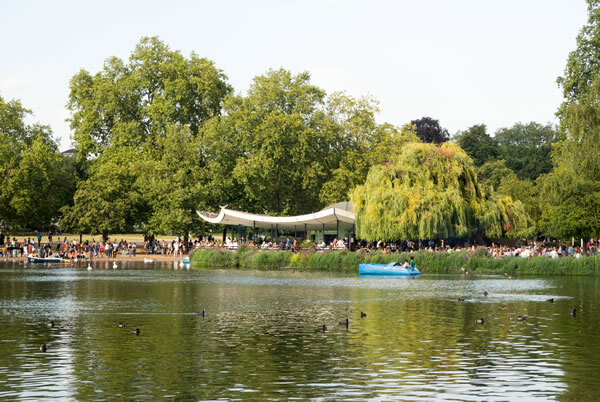 There will be weekly performances ranging from classic rock to big bands and jazz, all in the beautiful setting of The Regent’s Park, with views across the park’s boating lake and flowers. There’s no need to book – simply turn up and enjoy! There are a number of different gardens at The Regent’s Park, all with their own style. The Avenue Gardens, located near the Broad Walk, in the southeastern corner of the park, have a very classical feel, with tall topiary hedges, tiered fountains and vast ornamental bowls filled with flowers. Queen Mary’s Garden is a world famous garden, opened in 1932, displaying London’s largest collection of roses – around 12,000! Visit in the first two weeks of June for the best of rose displays. There’s also the Regent’s Allotment Garden, open to the public on weekdays, with advice on growing your own food. They also run open days and activities for those interested. A community wildlife garden has got locals involved in creating a wildlife-friendly space in the city, complete with bug houses, feeders and plenty of spaces for wildlife to hide. Artwork by local school children adds to the experience when visiting. Plenty of pitches here – from rugby to football, cricket, softball and even lacrosse, you’ll find it here. There’s also an onsite cafe and pay-as-you-go classes in yoga and pilates. From May to September there is a continual schedule of productions including theatre, music, comedy and film events, at the oldest, professional, permanent outdoor theatre in Britain. You’ll find the theatre within the Inner Circle of the park and accessible via Queen Mary’s Garden. Primrose Hill can be found at the northern end of The Regent’s Park, separated by the A5205 Prince Albert Road and the ZSL London Zoo. People come here for the climb to the top of the grassy hill with spectacular views over London (63 metres above sea level). Its history is a noble one – in 1841 it was purchased from Eton College to extend the parkland available to the poor people of north London for open-air recreation. There is also an oak tree, known as “Shakespeare’s Tree”, to mark the 300th anniversary of Shakespeare’s birth. The tree you see today is not the original planted in 1864, this one was planted in 1964. Richmond Park is the largest and the biggest enclosed space in London, covering some 2500 acres. It sits southeast of London, south of the river, bordering Wimbledon Common. 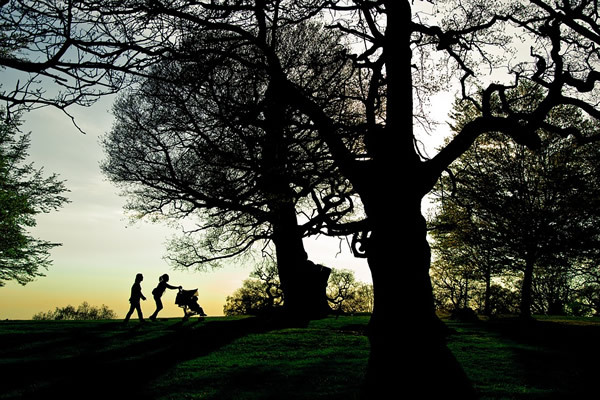 Richmond Park is famous for its wide open spaces, ancient trees, grasslands and deer herds. Free guided walks are a regular occurrence at Richmond Park, being held on the first Saturday of the month throughout the year. They start at 10am and are a chance for the public to learn something about the wildlife at the park, through the changing seasons. This year 90-minute horse carriage rides were offered from early June to early July. Check the website in the spring for information for next year. This park offers some more unusual pastimes including power kiting, and there’s also horse riding, golf, or you can hire a bike for some off-road cycling. 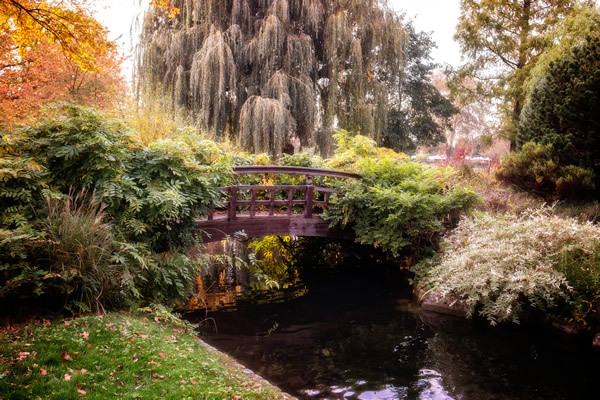 The Isabella Plantation was originally a Victorian woodland plantation planted in the 1830’s, now a 40-acre woodland garden has been planted with exotic plants that are of interest all year round. Look out for the azaleas and their bright colours in spring, which line the ponds and streams. A popular story tells that this was the spot where King Henry VIII stood on 19 May 1536 to watch a rocket fired from the Tower of London, as a signal that his wife Anne Boleyn had been executed for treason – so he was free to marry Lady Jane Seymour. However today, many people trek it to enjoy fabulous panoramic views of the Thames Valley and even a distant view of St. Paul’s Cathedral. Seeing the park by bike is probably a good way to do it. There are plenty of viewpoints to stop at, and refreshment places along the way, to make it a very enjoyable experience. To hire a bike in the summer you need to head to the Parkcycle centre, in the car park near Roehampton Gate during the summer. The Tamsin Trail is a good way to do this, as it is essentially a circuit of Richmond Park connecting the entrances at the various gates around the perimeter. Being almost entirely car-free, it is a perfect route for families and those who do not wish to deal with cars! It is a beautiful route in any season, a calm respite from the rest of London. For horse riding, it is not difficult to link with any number of local stables that will ride through Richmond Park. For golfers, Richmond Park Golf Course is a piece of history worth visiting. It was opened in 1923 by HRH Prince of Wales, and heralded as a place where ‘artisans and royalty are equally welcome’. £3 million of improvements have seen a brand new eco-friendly clubhouse, featuring an open plan coffee shop, bar and restaurant. Powerkiting, led by fully qualified instructors is also available by arrangement. Other sports include fishing in the Pen Ponds and rugby on any of three pitches, during the winter months. This playground can be found in a very easy access location on the western edge of the park, just near the Petersham Road. The water play and sandpit area are its stand out features. There’s plenty of seating for adults. Further south west of Richmond Park, Bushy Park forms a boundary with Hampton Court Palace. Stand out features include the Waterford Woodland Garden, the Diana Fountain and the Upper Lodge Water Gardens. People also come to enjoy the herds of roaming red and fallow deer. There’s even outdoor swimming at the ever popular Hampton Heath Open Air swimming pool. Chesnut Avenue is a mile long avenue, originally designed by Sir Christopher Wren as a formal approach to Hampton Court Palace. It was Queen Victoria who opened Bushy Park to the public, and a tradition we still call Chestnut Sunday was born. The origin of this was to admire the beautiful chestnut blooms at their finest in spring. Today Chesnut Avenue is the main road which is normally open to vehicles, but on the Sunday closest to 11th May, the Avenue becomes closed to traffic for around an hour, and there is a parade leaving from Teddington Gate, arriving at Diana Fountain. The parade has everything from vintage bicycles, WWII military vehicles and marching bands and horse rangers. At the end by the Diana Fountain people can enjoy a traditional fairground with a galloping horse carousel and plenty of other rides and stalls, which go on into the afternoon. A lovely day out. The Diana Fountain is a bronze statue of a goddess on a fountain made of marble and stone, standing in the middle of a huge water basin, giving the impression of floating on water. It was initially designed in 1637, later designed by Sir Christopher Wren. It was sympathetically restored in 2009 and now the Diana shines a beautiful golden colour, regally gazing over the water beneath her. You will find it as the junction of Chestnut and Lime Avenues. These gardens are a resurrection of former Baroque-style beauty, lost to time, as they were grown over during the latter half of the twentieth century. Today you can see the collection of pools, cascades, basins and a canal once more, as from 2010 when they were re-opened. As an interesting bit of history, they were used firstly as a hospital for Canadian troops in the First World War, then as swimming pools for East End Boys with respiratory diseases. The Water Gardens are open Tuesday to Sunday from 9am to dusk. 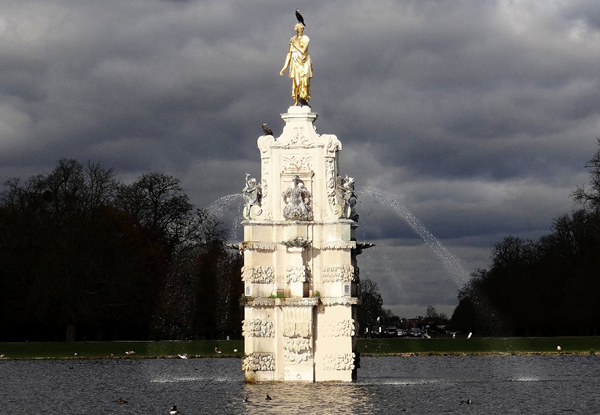 You will find the Bushy Park Playground located near the Diana Fountain, and the Hampton Court Gate entrance. The playground offers a large sandpit, climbing frame, balance beams, climbing boulders and more. You’re not stuck for choice at Bushy Park with tennis courts, cricket, rugby, bowls and fishing all on offer. From Hampton High Street, on the western boundary of the Park, you can also access Hampton Heated Open Air Pool and Fitness Gym. This is truly a relaxing place to spend an afternoon and popular with families and individuals alike. 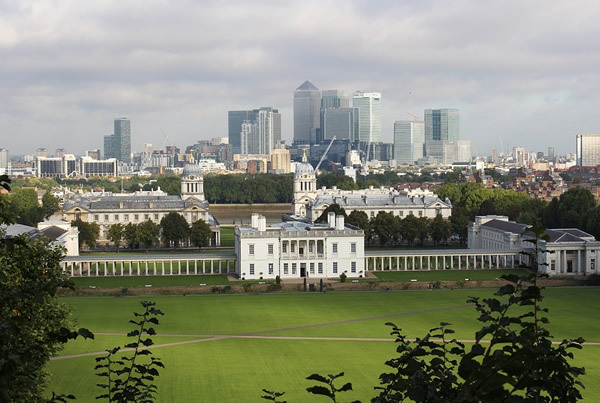 Greenwich Park is out on the eastern edge of London, just south of the river, with spectacular river views and a claim to being one of only four UNESCO World Heritage Sites in London. With its unique history as host to the Prime Meridian and the Royal Observatory, this park is a special place with a lot to offer. Summer events include many musical events at the much-loved bandstand such as jazz orchestras and Big Bands, and also organised runs and talks on the local wildlife. A popular way to arrive at Greenwich is by boat down the Thames, travelling from Westminster or the Tower of London. The London river leisure service make Greenwich a stop, landing at Greenwich Pier, seeing the attractions and getting a boat back at the end of the day. To get to the Royal Observatory you need to climb to the top of the hill here but you are rewarded with some of the best views over London, of historic maritime Greenwich. The Royal Observatory was founded in the 1670s by King Charles II, for the purposes of developing better naval navigation systems for the country’s sea traders and explorers. Today it is a ticketed attraction (buy online in advance to save money) which you can buy alone or in combination with the Cutty Sark. One of the big attractions here is the Meridian Line or Prime Meridian, the line which divides the eastern and western hemispheres of the earth – in the same way as the equator divides the northern and southern hemispheres. There are ways to see this for free outside the gates of the Observatory if you do not have the time or do not wish to look round. This museum has a lovely history – opened in 1937 by King George VI, it began life in 1807 as a school for the children of seafarers. It is now a UNESCO World Heritage Site. There’s plenty to see – always a gallery of special exhibitions, and the much loved “Voyagers” which introduces the story of Britain and the sea. The Cafe has lovely views over Greenwich Park. At the top of the park near to the National Maritime Museum is a children’s playground and a small lake offering boat hire from April to October. Cricket and tennis are also available at Greenwich Park. Like some of the other Royal Parks, Greenwich has its own herd of deer – but Greenwich is the oldest of London’s deer parks, having been enclosed in 1433. It has been home to Red and Fallow Deer since this time. You can find them today in The Wilderness, by the Flower Garden in the south-east of the park, where paths take you to special viewpoints to enjoy seeing them up close. The Wilderness is a special area where nature is allowed to thrive, and people can get closer thanks to the Secret Garden Wildlife Centre – a nature centre and hide that can be hired for small groups to use. Good for parties! There are many gardens to enjoy at Greenwich Park including the Rose Garden, Flower Garden, Herb Garden Herbaceous Border and the Queen’s Orchard, all at different corners of the park. It would take you some time to get around them all.